The Mississippi map turtles, also known as the “sawback” turtles, are popular with reptile hobbyists as their lively aquatic disposition and striking appearance make for interesting pets. 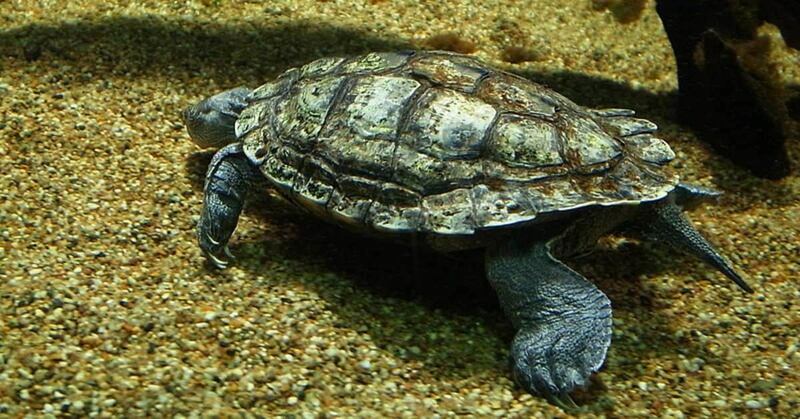 The “sawback” name is derived from the turtle’s saw-like raised back. Apart from the shape of the shell, another distinguishing feature of this species is the yellow strips that run along their bodies. These strips which look like contours coupled with the fact that they are native to the Mississippi valley in central U.S. give these turtles their name. Their biological name – Graptemys pseudogeographica kohni- is a mouthful and rather difficult to pronounce, just as most biological names are. Together with the false map turtles, they make up the only members of the false map turtle species which belongs to the Emydidae family. These turtles are strong swimmers and are just as comfortable in swift waters as they are in stagnant water. In the wild, these turtles prefer water bodies with moderate currents such as large streams, lakes, and rivers. If you desire to keep the Mississippi map as pets ensure they have a lot of room to swim in. Their size is another factor that makes them excellent pets. Adult males, who are smaller in size, grow up to 3½ – 5 inches in straight carapace length, while adult females grow up to 6 – 10 inches in straight carapace length. Carapace length refers to the length of the shell. Body build also varies between genders. While males have a lean appearance, the females have a bulky build. As aquatic turtles, Mississippi map turtles will only feed when in water. Feeding them can be tricky and should be done with care. Start off with a nutritionally balanced turtle pellet. Complement this with low-fat proteins, and leafy greens such as spinach, parsley, dandelion leaves, and romaine lettuce. The gender of the turtle determines the protein to feed them. While the males, which are smaller in size as compared to the females, can be fed pieces of fish, mollusks, mealworms (dead), crustaceans and aquatic insects, females, can eat larger prey such as clams and snails. It is important to avoid feeding your turtle too much protein. Doing this can lead to pyramiding of the shell and unhealthy growth rate. The turtles should be fed balanced diets. Adults should feed 4 or 5 times a weeks, while young turtles should feed once daily. Overfeeding the turtle can lead to obesity and must be avoided. The Mississippi map turtles are most comfortable in large turtle tanks. For a female, an enclosure that can hold 75 gallons will do. For the smaller male counterpart, a 25-gallon turtle tank will suffice. The water’s quality is just as important as its quantity. A powerful water filter is a prudent investment as it allows for adequate oxygen levels as well as keeps the water clean and clear. This species of turtle also enjoys basking, as such, it is necessary to have a couple of flat surfaces where the turtle can bask. This way the turtle can regulate its body temperature through swimming and basking. A reptile UVB light is helpful when it comes to warming the basking area. This UVB light should be placed over the basking areas and should always be on. Regular cool fluorescent lights can be used to mimic the passage of night and day. If you can’t reliably turn the lights on and off at the same times every day, you can acquire a timer. While males start mating between the ages 4 and 6 years, it takes females longer to reach sexual maturity – between ages 8 and 14 years. In their natural habitat, they mate in October/November and again in April with nesting occurring in mid-May to late July. The mothers build nests anywhere between 16 and 490 feet from the water bodies where the hatchlings will grow. Beaches with low shrubs and sandy beaches are preferred. Females usually lay 3 clutches of eggs a year, with each clutch made up of 8 to 22 eggs. 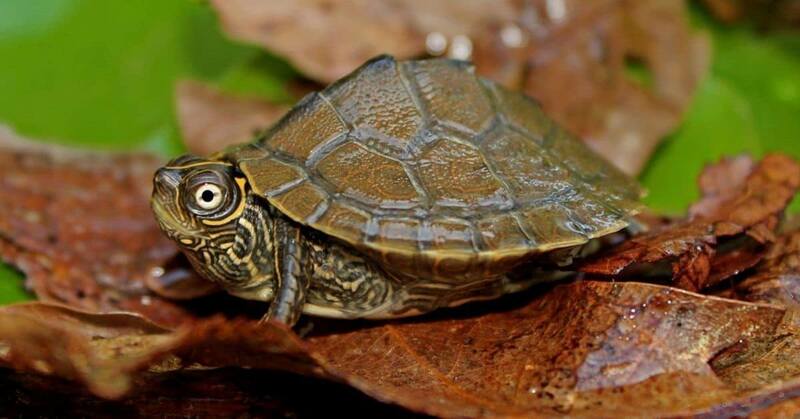 When approached, the skittish sawback map turtle will usually attempt to flee. Unlike other turtles, these gentle creatures don’t bite when handled. Predators of young sawback map turtles are rice rats. Otters, raccoons and red foxes are predators of the eggs while pike, catfish, bass, great blue herons. Red-winged blackbirds, grackles, ring-billed gulls are predators of the hatchlings. In the wild, the marking, color, and shape of this species allow them to blend into their environment and avoid confrontation with predators. This cryptic adaptation helps them avoid detection and is their best defense against predation. Taking care of a Mississippi map turtle can be a challenging task since they stress easily and are skittish. They need large turtle tanks preferably with aquatic vegetation and clean water. With all that said, caring for the sawback is a rewarding experience as they make great pets. In addition, their yellow stripes and sawback shell give them an eye-catching appearance. When acquiring any turtle, it is essential that you obtain them from trustworthy breeders or pet shops, and the Mississippi map turtle is no exception. Let us know your experience with this turtle in the comments below.